It's not everyday that aliens invade your classroom and teach math!Come along for the ride as aliens from outer space use twizzlers to explain numbers as fractions, decimals, and percentages. See how numbers are used in everyday situations, sports, and school. This math lesson is certainly out of this world. 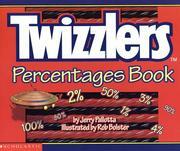 Pallotta, Jerry, “Twizzlers percentages book,” Children's Picture Book Database at Miami University, accessed April 24, 2019, https://dlp.lib.miamioh.edu/picturebook/items/show/10345.